As part of Digital Leaders Week 2018 Wigan Council is hosting its 3rd Destination Digital event. Warren is pleased to be delivering his thought-provoking presentation at this event on June 20th from 730am. 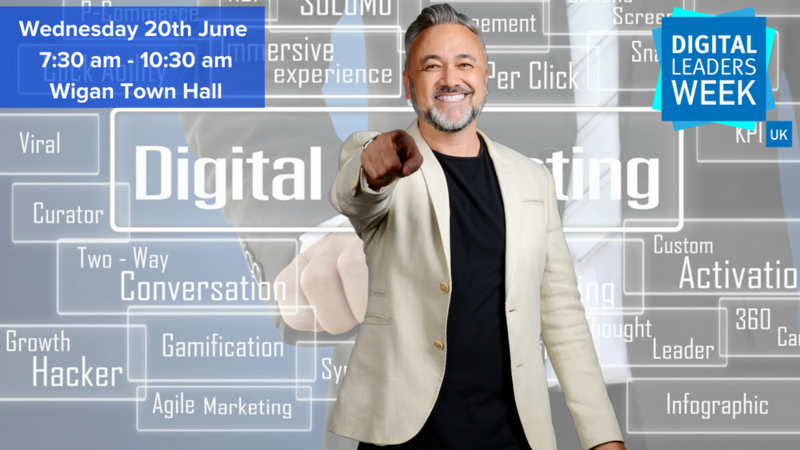 In it he will demystify how your online customer is “thinking” and why every business owner, entrepreneur and sales & marketing manager must integrate their sales and marketing strategy into their digital marketing plan as a digital leader. He will also highlight the importance of utilising SEO, Social Media, PPC, and Email Marketing to generate leads to win new business. Warren will also be giving away 50 copes of his book Think #Digital First. This, Wigan Council’s 3rd Destination Digital event will be opened by the Leader of the council, this will be followed by Alison McKenzie-Folan, deputy CEO Wigan Council, who will offer insight into Digital Leaders Week and the council’s own digital strategy and vision for the future. There will then be 3 local business sharing their digital journeys followed by Warren’s keynote. The event will end with an opportunity to ask questions and network.